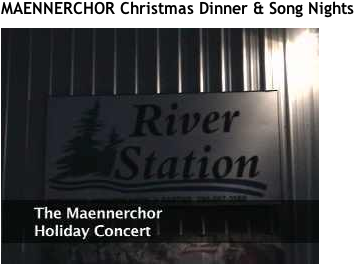 This year the Cold Spring Area Maennerchor held a Christmas Dinnner & Song concert at River Station in Richmond. It was an "Old Christmas" theme with all the trimmings. 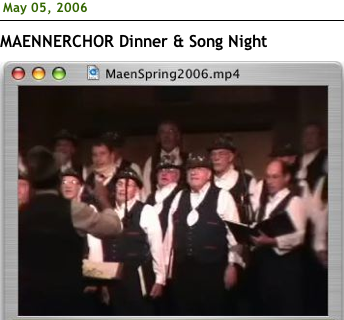 In this story you'll hear a number of Christmas tunes and you'll also hear from a number of Maennerchor members as to how and why they got involved with the 50 member mens' chorus. 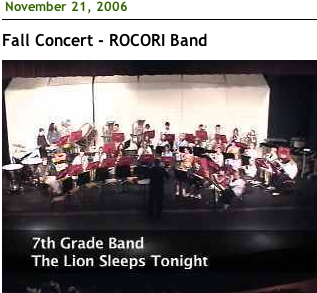 It's a compilation of the 7th, 8th, and Senior High Concert Band and Wind Ensemble. 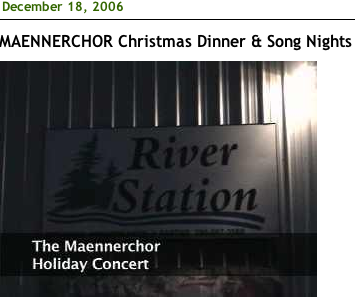 Directed by Tony Hutar, in this story you'll get a sampling of all the songs performed during the entire one hour concert. This past weekend September 29th, was Homecoming at ROCORI High School in Cold Spring. The ROCORI Marching Band and Color Guard performed during the halftime show at the Friday night Varsity football game. The group is in the middle of their Fall Field Show season. The show this year is entitled: "Phantom of the Piano Studio". We used two cameras to capture this performance and we think you'll enjoy the results. Special thanks to Pat Grelson for her super camera work up on top of the press box. In this clip we interview Tony Hutar, the ROCORI Marching Band director. Tony conducted his second Marching Band Summer Camp and has just completed his first year in the ROCORI district. We sprinkle in some footage that we captured of the practice for the marching band and also the color guard. 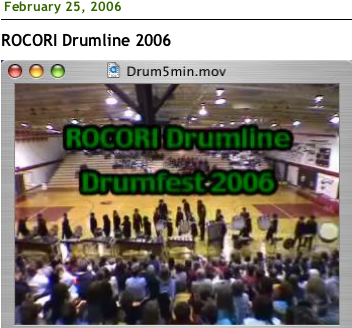 Mr. Hutar has some aggressive plans for the ROCORI Band program in the near future. 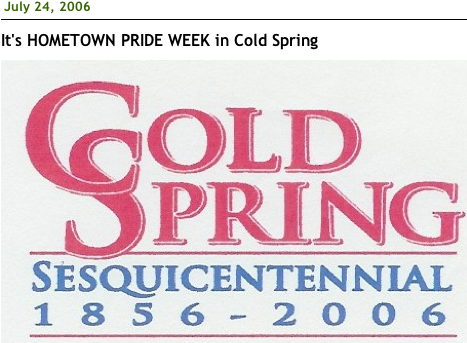 This year's Cold Spring hometown Pride festival will be bigger and better than ever. 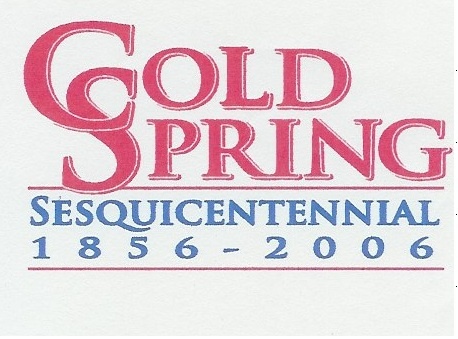 Included with the festival will be a celebration of the city of Cold Spring's 150th birthday known as the Cold Spring Sesquicentennial. 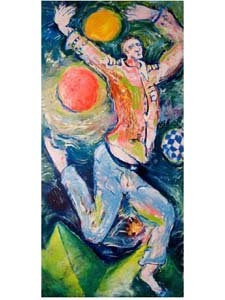 Everything begins Friday July 28th on the grounds of the Gluek Brewing company in downtown Cold Spring. Along with the usual activities, food booths, car show and exciting entertainment, the festival will feature country recording star Tracy Byrd on Friday evening and will add dazzling fireworks to Saturday evenings live music & beer garden. Plan to be a part of this very special Hometown Pride - Sesquicentennial weekend festival. • Free Pancake Breakfast	7:30 to 10:00 a.m.
• Medallion Hunt	1:00 p.m.
• Turtle Races	3:00 p.m.
• Big Wheel Races	4:00 p.m.
• Kiddie Parade	5:30 p.m.
• Gluek Brewery Tours	Noon to 5:00 p.m.
• Little Miss Cold Spring Pageant	5:00 p.m.
• Tracy Byrd Concert	8:00 p.m.
• Diamondback	6:00 p.m. & 10:00 p.m.
• Red River Run 8 a.m.
• Craft Fair 9 a.m. - 3 p.m.
• Car Show/Classic Snowmobiles/ Restored Tractors 7:30 a.m.-3:30 p.m.
• Gluek Brewery Tours noon to 5:00 p.m.
• Fire Department Water-ball Fight	7:00 p.m.
• “We Care Pride Ride” food shelf benefit motorcycle ride	2:30 p.m.
• Beer Can & Memorabilia Show & Swap Meet	7:30 a.m.-3:30 p.m. Cold Spring Area Community Band 10:30 a.m.
Hermie & Country Cruisers	Noon-3:00 p.m.
Ray Drontle Orchestra	4:00 p.m- 7:30 p.m.
Maggie James Band	8:30 p.m.
• Food booths and Beer Gardens available throughout the weekend. This year's Rockville parade was held Saturday night as a part of the ROCK-FEST festival. We were unit number 79 among a total of around 100 units. This is a story about the people sitting along the parade route and their willingness to do the "DigElog WAVE!" It's a fun piece with coverage of hundreds of folks who were enjoying the parade. There's also great coverage here of the St. Cloud Community Band. The band, who was located right in front of the DigElogROCORI van, did some very nice things in this video story. You'll enjoy watching it. 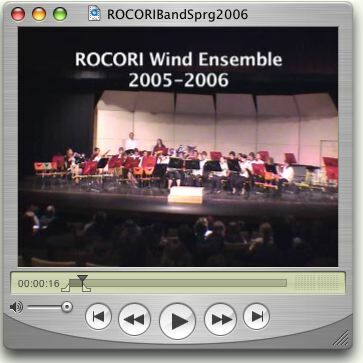 The ROCORI Wind Ensemble gave their final concert of the year last week. Included with this story is recognition of those seniors who will be graduating on June 3rd, 2006. Two seniors received special awards. Adam Kuechle accepted the Marching Band Award and Katie Wolf was given the John Phillip Suza award. This concert brought a close to Band Director Tony Hutar first year in the ROCORI School District. 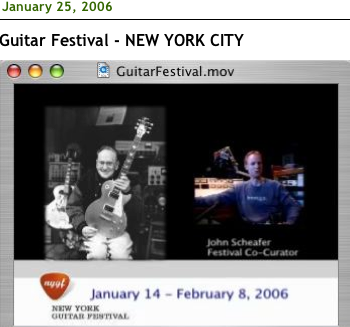 Check out Director Hutar's first interview in August of 2005.